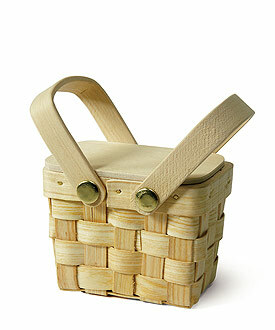 This mini picnic basket comes with an optional solid lid and adorable double handles. 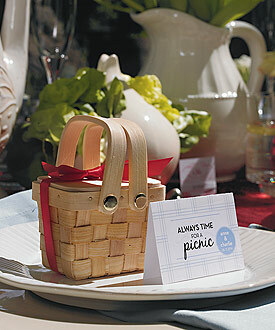 The lid can be simply and decoratively held in place with a pretty wrap of ribbon tied into a bow. If desired, the lid can be eliminated all together. This will accommodate larger fillers such as homemade cookies or similar confections that require just a little more space. Regardless of what you choose to tuck inside, the resulting favor will have distinctive casual charm. Note: Sold as a set of 6. Ribbon and Card sold separately.